It’s been said many times that roller derby is unique in sports. If that’s the case, Roller Game Japan is unique in roller derby in the same way. This is because of both the rules and format of the game, both of which look as if they could only be dreamed up by those wacky Japanese. For example, outside of the 60-second jams, the game is not timed. The game format more resembles tennis than roller derby, with points awarded in sets and a match winner being declared after enough sets have been won. Instead of trying to define a pack, there simply isn’t one, allowing blockers to engage anyone, anywhere. The defense has as many ways of ending the jam as does the jammer. Even jam starts are strange, with players entering the track and slowly circling around it before the jam begins in anger. Despite the weirdness, the game is remarkably simple to follow. It’s probably the simplest form of roller derby that has ever existed, in fact. Its rules are also fairly straightforward. Because the game is still being played today, RGJL differs from other versions of roller derby featured in the Another Derby series in that an official overview of its rules are available online…in Japanese, of course. In case you don’t read the Moon Language, below are the general rules of Roller Game Japan—in English. And don’t forget about the bold and underlined sections of the rules, building blocks of universally important roller derby concepts, which you may want to keep in mind as you head forth into the next two chapters. Track – The game may be played on either a flat track or banked track. The flat track surface is a 100-meter oval with two identical start lane markings located on opposite sides of the track. Blocker entry/jammer start lanes are the inside of the track behind the start markings. There is also an inner boundary line, but no outer boundary line. The full width of the track, from the inner boundary to the rink boards, are in-bounds. Skaters are considered in-bounds if any part of their skates is touching in-bounds, even if they are partially out-of-bounds. The banked track is of the usual size and has the same start lane markings, but the jammer start areas are located behind them on the high side of the track. The flat infield area is in play and may be skated on provided a player has at least one skate in-bounds on the track surface. Structure – Games are not timed and may consist of up to five skating periods, or “sets.” Each set has its own individual score—points are not cumulative between sets. A “halftime” break is taken between the second and third sets. The team that is the first to win three sets, regardless of overall point total, wins the game. Any remaining sets after a winner has been determined are not played. Sets – Each set consists of up to six total jams. Teams alternate jams playing offense (with the jammer) and defense (no jammer) with each team getting three opportunities to jam and score while on offense. (The defense can never score points.) The team with the most points in a set, wins that set. If the score is tied after the last jam of the set, each team gets an additional jam on offense until the tie is broken for the set. Points are reset to zero to start play in the next set. Points do not carry over between sets. A coin flip determines which team plays offense in the first jam of the first set; the first jam alternates teams in subsequent sets. Jams – Before a jam begins, an installation lap takes place. The offensive blockers enter the track from their start area and skate a half-lap to “pick up” the defensive blockers on their side of the track. Then both teams make their way around back to the offensive start area to prepare for the start of the jam. For a fair jam start, all blockers must line up (still skating forward) within the start lanes and behind the start line. The defense must always line up in the inside lane and offense in the outside lane. Once all blockers are in position, the jam start whistle sounds for the jammer to enter the track and begin play. Jammer – Designated with a solid white helmet, almost always a full-face motocross-style helmet. They are the offense, with the ability to score points by passing players of the defensive team. There can be only one jammer on the track at any time. A team may only field a jammer when it is their turn to play offense during a jam. The jammer may briefly skate in a clockwise direction, but only in an attempt to avoid a block or to reset after a fall. Blockers – Designated with a team-colored helmet. All players that are not the jammer, must be blockers. The offensive blockers attempt to impede and slow the defensive blockers and assist their jammer through the pack using blocks and whips. The defensive blockers attempt to impede or evade the jammer to prevent from being scored upon, or block the jammer out of bounds to force the end of the jam. Helmet Restrictions – As a safety precaution, helmets (as well as protective body padding) are required to be worn by all players at all times, with the jammer generally required to wear a full-face helmet for his or her protection. The jam start formation for Roller Game Japan, pictured left. Note the relative width of the track compared today’s standardized flat track. The Pack – Blockers are required to remain in formation during the pre-jam installation lap. Once the jam begins, blockers on both teams are free to skate without speed or formation restrictions. All in-bounds players are always in-play, regardless of their location on the track or relative position to other players. 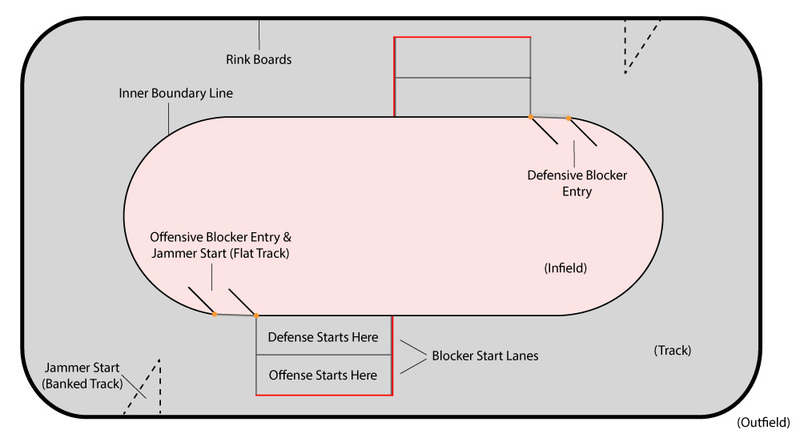 Blockers may not skate clockwise around the track, but may stop on the track to wait for the jammer or the other players to come around in order to re-engage opponents or assist teammates. Players may use positional blocks, shoulder blocks, hip blocks, leg blocks, jump blocks, and hockey-style arm contact to impede or knock down opponents. Players may not use the point of the knee, the point of the elbow, or their skates in blocks. Players performing blocks may only make primary contact on the recipient below the shoulders and above the knees, and never at the head or on a fallen player. Yellow card – Given for an unintentional or minor foul. Warning only. A second yellow card to an individual player results in an automatic red card. Red card – Intentional or severe foul, or an accumulation of two yellow cards. The offending skater will sit in penalty box for two jams (one each on offense/defense) and their team will be forced to skate one blocker short. A jammer receiving a red card serves any penalty as a blocker in subsequent jams. Penalty enforcement – After a jam begins, any penalties that do not cause jam to reset or end will be signaled by the infield referee or officials at the scoring table by use of penalty flags (yellow or red). Penalties that require a player be sent to the penalty box are enforced at the end of a jam, never during a jam. Penalties may carry over between sets, if necessary. Once the jam begins and the jammer enters the track, they are immediately eligible to score points. A point is earned for every opponent passed by the jammer, per lap of the opponent, starting on the first pass. (There is no “initial pass” sequence.) Once a point is earned, the point cannot be taken away even if the scored upon opponent re-passes the jammer on the same lap. A jammer cannot score more than one point on a single opposing blocker while on the same skating lap as that blocker. Such are the rules of Roller Game Japan. Its offense vs. defense/jam-set-match format is not only unique, but it provides many advantages over more traditional versions of roller derby. In the early 1950s, the last time legitimate roller derby was attempted, it was discovered very quickly that teams built for a scripted show were competitively unbalanced when they played the game straight. (Think the Harlem Globetrotters, but in the NBA.) Since then, blowouts have been a danger in all forms of competitive roller derby, particularly that of today. The Roller Game Japan game format addresses this problem by breaking up one big game into several smaller competitive chunks. Because scoring a lot of points in any one jam is difficult to do (“a lot” in this context is “more than 4 points”), it makes it very unlikely that a team can get an insurmountable lead in set, always giving an inferior opponent a chance to capitalize on a bad series of jams. Since all that matters is scoring more points in a set, not across a whole game, it makes each set, and therefore the game, feel close the whole way through, even if the result is ultimately a 3-set sweep by the victor. Even with the legit-scripted hybrid revival of today, the set format can protect the legitimate portions of the game from the scripted portion at the end since sets are self-contained and don’t have any effect on each other as far as the final result of the game is concerned. For example, the first two or three sets could be played without a script, keeping the game legit, with only the final set being pre-determined, so the fans are guaranteed an exciting finish they’ll remember—and potentially want to come back to see it again next time. But the weirdness of the game format is small potatoes compared to the most radical change, the one that set apart Roller Game Japan from all other versions of the game. Having only one jammer on the track was considered revolutionary at the time. But even though today’s game has the power jam aspect, the thing that makes the Japanese variant stand alone is the fact that every aspect of the game was designed and built around a perpetual one-jammer environment. The reason why Koizumi’s game is designed the way that it is the key to fully appreciating it, and it’s also something from which today’s roller derby can learn a great deal from. 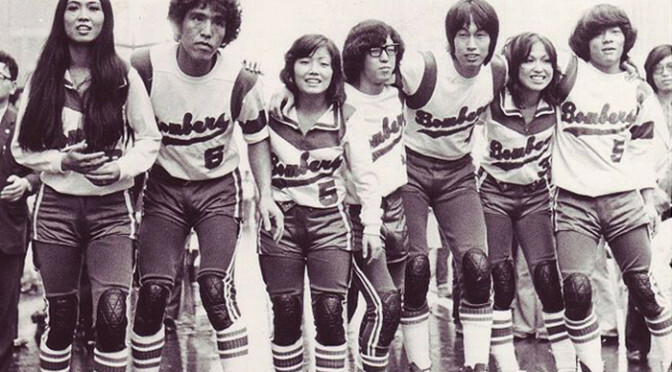 However, to fully understand the madness behind the lone Japanese jammer in a motorcycle helmet, we just first learn why Leo Seltzer’s original invention of roller derby was designed to always have both teams field a jammer on the track at all times. The 1992 RGJL season was decided by use of this tiebreaker when the top two teams had equal win-loss records; the champ (the Cosmos) lost one fewer game set than the runner-up (the Bombers) over the course of the 18-game season, which proved to be the difference.